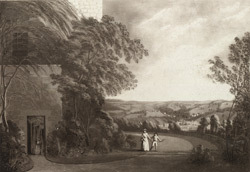 This country house, known as Summer Hill, belonged to Dr Caleb Parry, for whom this and five other views of the area were made. Parry was a physician, agriculturalist and geologist. The house was situated at Wick, near Bath, also known as Bathwick.